Decided to relive the tale of the 60,000,000,000 Double Dollar man know as Vash the Stampede these last few weeks. The last time I watched the series was about 10yrs ago. I loved every minute of it then and after re-watching it I can honestly say I love it even more now. If you’re unfamiliar with Trigun, the story is about a heroic, granted idiotic, character named Vash The Stampede. There’s a bounty on his head for $60,000,000,000 Double Dollars for completely destroying the city of “July”. But right off the bat, the fun-loving, light-hearted character Vash is only out to help others and save lives whether they be good of evil. Trouble seems to follow Vash wherever he goes though. So much so that he earned the nickname, “The Humanoid Typhoon”. And that’s where the female presence enters the show. The characters Milly Thompson and Meryl Stryfe work for the Bernardelli Insurance company and its their job to track down and follow Vash around to prevent anymore disasters from happening. Meryl and Milly add great character support throughout the series especially when the later episodes start to get much darker. And let’s not forget Mr. Nicholas D. Wolfwood. He’s the traveling priest of the show who ultimately becomes Vash’s bestfriend. Wolfwood’s past/history remain a secret until towards the very end, but he does add the edge the show needs after watching all the light-hearted acts Vash commits throughout the series. In the beginning of the series most of the episodes are about the single acts of good that Vash is doing. Saving cities, rescuing people, ect. But down the line the story starts to get much deeper when the Gung-Ho Guns arrive led by the sinister Legato Bluesummers. The Gung-Ho Guns are out to kill Vash, but instead of for the $60,000,000,000 Double Dollars they’re working for Knives Millions, Vash’s twin brother. If you haven’t seen the series, I’ll leave it at that. As for the DVD Set itself, it has a cool layout. It comes in a thin box, and 2 DVD cases that hold the 4 disc set. The DVD Boxset is definitely lacking in special features however, all that’s included are trailers and the theme songs. The format of the DVD’s is also standard definition (4:3), so you will be watching the series with black bars on the sides if you have a HDTV. However it does look very crisp, especially with PS3 DVD up-scaling. If you’re looking for a series that has a lot of depth to it and isn’t all about the murder whatever is insight to survive, Trigun is your show. You really get lost in it. I would rate the series a 9.0/10. The DVD Boxset however earns an 7.5/10 (No special features, Standard Definition). Don’t miss out on this anime if you haven’t watched it yet, it’s worth every minute. Yasuhiro Nightow is a creative genius. For those of you who don’t know what Salt is, basically it’s an movie starring Angelina Jolie who play’s an CIA agent named “Evelyn Salt.” The CIA have this guy in custody named “Orlov”. He’s this Russian dude who claims he’s got info on an terrorist attack fittin’ to happen, and that Salt is really an Russian spy a.k.a. an sleeper agent in America’s government. This is all in the commercials, so don’t worry I’m not ruining anything for you. At this point, Salt’s all like, “Say what…?” And from then on the movie starts to get crazy. Angelina Jolie did an excellent job portraying the character. She’s always been an pretty good actress, and we knew she could do action/adventure stuff from her run as the Tomb Raider. But this was REALLY well done. 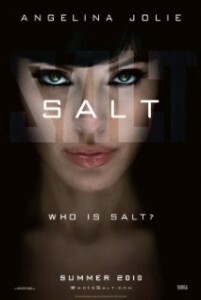 Salt was basically the female version of Jack Bauer from 24 as far as action goes mixed with Jason Bourne. Yeah, it was that good. When 24 the movie comes out, I can only hope they set the standard as high as this movie did. There is an lot of mayhem in this movie, and amazingly they managed to keep it clean. There was very subtle cussing and it lived up to it’s PG-13 rating without making it feel like an kids show. And they managed to pull off the action in an very 24-ish/Bourne Identity kind of way along with lots of parkour scenes. 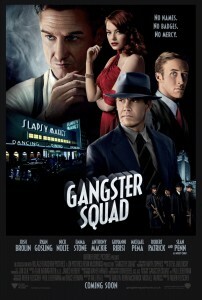 Those who have seen Liam Neeson’s Taken can get an idea of how the action went in this film. It does have it’s dark moments at times and goes for some shock value. There were a few scenes in the film where people in the theater gasped at what was happening on screen. I think that’s a good thing though, it preserves the realism effect. The movie really takes you on an ride as you follow the story of Salt and the whole time you’re trying to figure out is she really an terrorist or was she framed? I’d give this film 5 out of 5 stars and would definitely go see it again.